A musical revue of the songs of Burkell and Loesel. This extremely adaptable revue is perfect for groups who are looking for a way to showcase a varied number and various types of performers. The show can play with as few as 4 actor/singers and can be expanded to hold your entire community theatre or university group. Songs vary from sincere and heartfelt ballads to wacky, comedic character turns. Something for everyone! 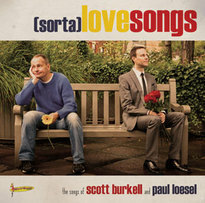 The CD includes thirteen original scores by the artists, acclaimed composer, Paul Loesel (Burton Lane Award recipient 2010) and lyricist, Scott Burkell in their inaugural Album, Sorta Love Songs. The album was recorded at MSR Studios in Manhattan where seventeen top Broadway performers joined the creators to record these original works. 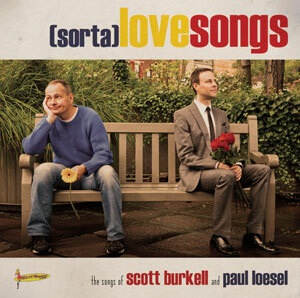 The music of Scott Burkell and Paul Loesel has been described by Kate Baldwin as “sweet, heartfelt and honest.” In an interview following her recording, Stephanie J. Block exclaimed, “I fell in love with your music, with your person, with your work ethic, with everything!"